When you hear the word – daisy, a specific flower doubtless comes to mind. Many plants share a name with the daisy but when most people are talking about daisies, they are likely referring to Bellis perennis. While the vast majority of people know it as the daisy, the flower also goes by a number of other common names including Wild daisy, lawn daisy, common daisy, English daisy. Some of its other common names such as woundwort and bruisewort give a not too subtle hint at some of its potential medicinal uses. The plant is native to many parts of Europe but is now naturalized in all corners of the globe. The Latin name for the plant – Bellis Perennis is derived from the word ‘bellus’ meaning beautiful and ‘perennis’ meaming forever. This seems appropriate given that daisies are used on the skin to improve general skin health and beauty and also to eradicate many of the signs of aging like wrinkles and sun damage. As well as its lovely appearance and delightful fragrance, daisies have been used as a medicinal plant for a very long time. They can be used to make ointments and applied topically to the skin, used as an ingredient in cooking or to make tea while extracts are also used to make supplementary treatments. If you would like to find out more about how daisies can benefit your health and appearance and how to use them, I am sure you will find plenty of interest in this article. The many potential health benefits of daisies come down to its diverse range of chemical compounds. The plant contains the following compounds all of which confer various health benefits. Flavonoids : Flavonoids found in daisies can help treat a wide range of conditions. They have excellent antioxidant properties as well as the ability to reduce inflammation. Anthocyanins : Anthocyanins also have excellent antioxidant properties. They are present in many of the red and purple colored superfoods like blueberries, cranberries and maqui berries. Polyphenols : Polyphenols also have excellent antioxidant properties and help absorb the body to absorb nutrients more effectively. Daisies also contain triterpenes and saponins. These compounds give the daisy a range of medicinal actions. These include anti-inflammatory, antioxidant, hemolytic, cytotoxic, dermatological, astringent, antibacterial and hypolipidemic properties. The history of the daisy being used as a medicinal plant goes back thousands of years. According to historical documents, daisies have been used since at least 2000 B.C. There is some evidence that the flowers were cultivated by the ancient Egyptians who used them for a range of ailments. The use of daisies in medicine by herbalists spread around the world and continues to the present day. In the 16th century, the renowned herbalist John Gerrard noted that daisy extracts could be used to treat a broad range of conditions. These included inflammation, bruises, digestive complaints, pleurisy, coughs and other respiratory conditions, headaches, liver conditions, kidney issues and gallbladder issues. The flower has also been used by women to treat swollen breasts and menstrual bleeding. These days, daisies are still used to treat a wide range of internal issues but have become increasingly popular as an ingredient in skin care products. Because of its natural antibacterial properties, this flower is extremely effective in wound healing and treating bruised and damaged skin. Daisies also have astringent and antioxidant properties and are used as an ingredient in skin care products including ointments, lotions, serums and even natural whitening products. Daisy flower can be used in one of several forms to help treat colds, bronchitis and other respiratory issues. The flower has anti-inflammatory and expectorant properties that can help free up the build up of phlegm and mucus in the respiratory system and help you breathe more freely. One great way to help treat a cough, cold or bronchitis is to make a healthy cup of daisy tea. It is simple to make, safe in appropriate doses and highly effective. Daisy tea can also be used as a mouthwash to help relieve sore throat and inflammation in the mouth. A cup of daisy tea may help prevent indigestion and help to treat a number of common digestive complaints. According to proponents, daisies can help stimulate the digestive system to ensure that it is in better working order to absorb and digest your food. This remedy might also help ease bloating, constipation and stomach cramps while also boosting the appetite. Daisy extract might also have antispasmodic actions that can help reduce cramping in the stomach and in other parts of the body. There is no specific research into the effects of daisies on cramping but people who use it claim that it is an effective remedy for cramps and muscle spasms. Daises may have natural diuretic effects that can help promote the passage of excess fluids from the body. Drinking daisy tea may promote sweating and help relieve fevers. It is also sometimes also used in a compress which is placed against the forehead to help relieve fever and associated headaches. Daisies have anti-inflammatory properties that can help reduce inflammation associated with common joint issues including arthritis and rheumatism. One of the common English names for daisies is ‘Bruisewort;. This gives you a major clue as to one of its traditional uses. Daisy can be used as an ingredient in topical ointments to help treat bruises but it may also help heal a range of other skin wounds including cuts, scratches and sores. Daisy flower also contains excellent antibacterial properties meaning that it can kill off bacteria in any wounds or sores and help prevent the bacteria from spreading. This maybe why the flowers were used in a poultice on the battle fields going back to ancient times. Daisy flower can be applied topically to help lighten the skin and to deal with a number of common skin complaints as well as simply taking care of your skin’s overall health and appearance. These are some of the conditions for which daisy flower can be used. Sunspots occur when your skin is exposed to the sun’s powerful UV rays for a prolonged period of time. These flat, brown patches can appear anywhere on the body which is exposed to the sun on a regular basis including the hands, face, neck and forehead. Sunspots are very difficult to treat especially if you find products containing hydroquinone difficult to tolerate. Fortunately, daisy extract is known to help lighten the skin with far less risk of the side effects people often get from commercial lightening products. Exposure to environmental pollutants as well as the sun’s UV rays can lead to skin damage and result in premature signs of aging like wrinkles or sagging skin. Daisy flower is replete with antioxidants that can help reverse much of this damage and help your skin look younger, firmer and tighter. The entire flower is used to make supplements including tinctures and liquid extract as well as being used in topical creams and ointments. Make sure that you read the manufacturer’s label correctly before using any daisy products. You can also make a nice cup of daisy tea to help treat several conditions including indigestion and joint pain. Making daisy tea is as easy as making any other brew. All you need are some dried flowers and some water. To make your tea, add one or two tablespoons of the dried flowers to a cup of boiling water. Let the mixture sit and steep for around 10 minutes, strain and drink up. You can add honey to taste and drink up to three cups each day. There is not enough scientific data regarding the safety of using daisies internally to recommend a dose. However, it may be safe to use daisies internally in suitable doses. There is no information regarding side effects but people with allergies to other members of the Astaracea family may suffer an allergic reaction and should avoid using daisy either internally or topically. Other plants in the same family include ragweed, marigold and chrysanthemums. Women who are pregnant or breastfeeding should stay on the side of caution and avoid using daisy. 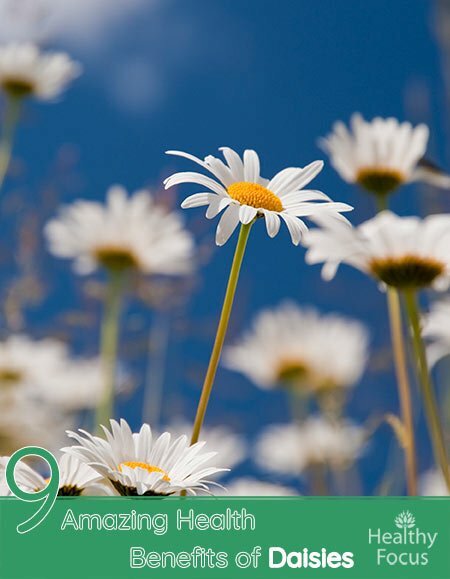 Daisies have a number of medicinal compounds that can be useful to your health. They have antioxidant, anti-inflammatory, antibacterial and hemolytic properties. Daisy flower extract is available in the form of liquid extracts and tinctures and they are often consumed in the form of a tea. Among the conditions, daisy flower can help treat are arthritis, colds and coughs, indigestion and upset stomach. Daisy can also be applied topically to help treat wounds, bruises and cuts and to help lighten the skin and reduce blemishes and wrinkles.